Waswas time was really special. The village people also value waswas time. Around about 5pm every evening we (Mike, Lyn and I) would wander down to the same spot along the river for a bit of a wash – fully clothed! The river had quite a current, so despite the muddy brown colour, it was rather fresh water. It was dry season, so the river was low, it came to just above my knees in the centre. I would wear my crocs just in case there were worms or other such delights at the bottom of the riverbed! Our waswas time was a bit different to the locals in that we stood out like sore thumbs and hence attracted quite a crowd. One time Lyn’s sarong fell off from around her body and the squeals of delight were quite funny. I love water and swimming and so when I plunged into the river, then lay on my back floating with the current, it stirred up quite a response from the onlookers. Must have looked strange: tall, very white woman in bright sarong and red crocs floating down river… You can imagine that scene can’t you? 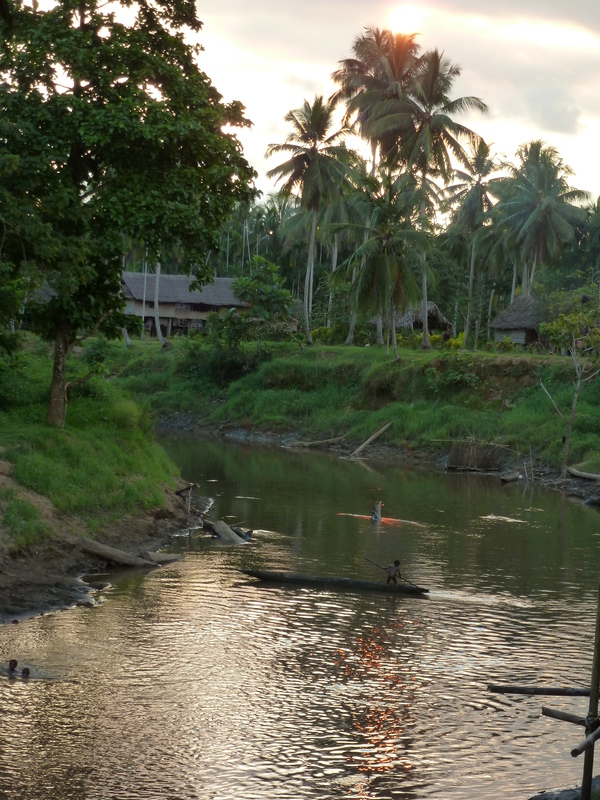 The river is such a rich source of life for the village. Everything happens around, in and through the river. It provides fish and crocodiles as food, drinking water, washing water, irrigation for crops, transport and access to other towns and villages, fun and relaxation and most importantly somewhere cool to escape the heat and humidity. At the end of the day we’d often hear shrieks of laughter from children playing in the river. They’d float along in canoes, then jump into the water, paddle upstream again or across to the other side, fall in the water, climb back into the canoe and so on. Not a life jacket in sight and the kids were often really young too! One time a young boy had the bladder from an old football. Lyn had pumped it up for him and this provided great entertainment in the water! The river could also be the bearer of death and destruction. 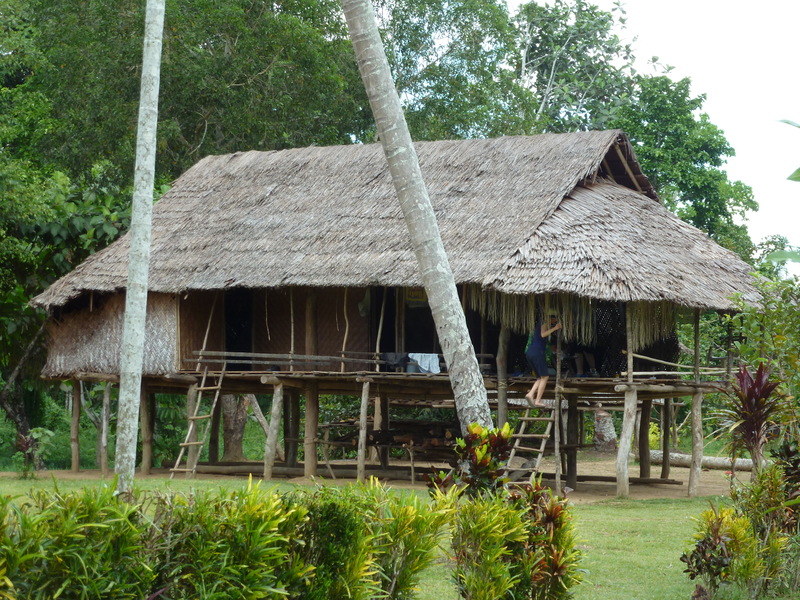 The houses are all built on stilts to preserve against high tides during the wet season. We were told that many children get swept to their deaths when the tides are high and the current strong. Along the riverbanks we saw fish traps made from bamboo that are used during times of high tide. The fish are trapped inside as the fast current flows past the structure, they dive down for food which has been placed at the bottom and then they then can’t get out. The traps were high up, so it gave a glimpse of what the river looks like during those times. 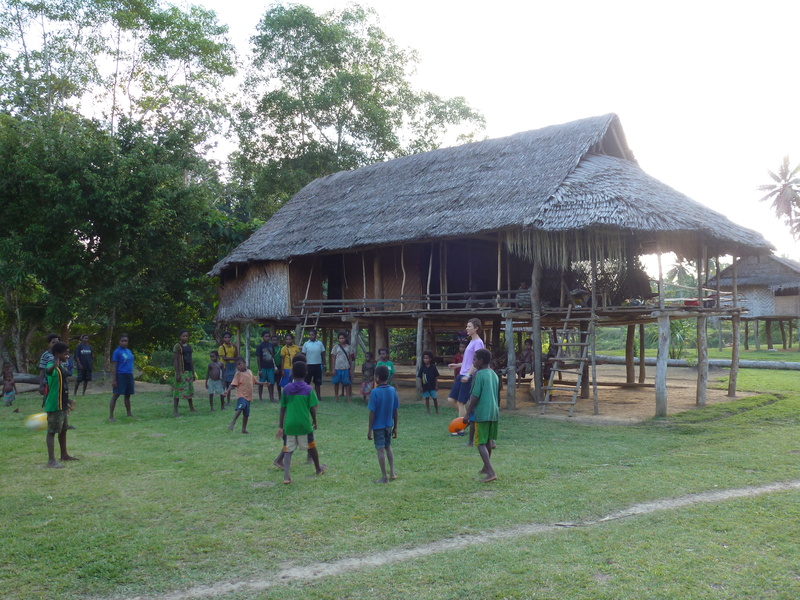 Closer to Angoram and the mighty Sepik River, the flats or grasslands as the locals called them, the houses were high and dry at this time. I could picture what the area would look like once the rains came! Water, water everywhere. The people would be confined to their houses or canoes. Completely exposed to the element of water. 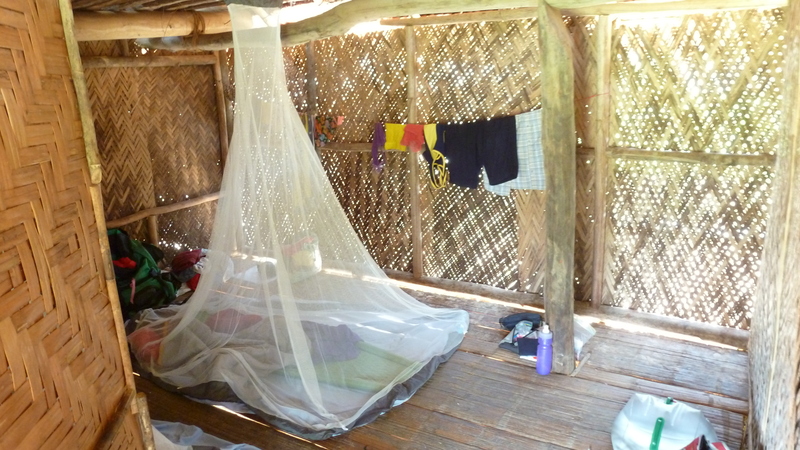 I admit, I’m glad we were there in the dry season. I don’t think I could cope in the wet. This weekend I have sorting out our house, contents and building insurances – something I hate doing! Reading through all the fine print does my head in. Wading through the information and trying to work out whether we’re overinsured, underinsured or being taken for a ride. Trying to have an objective view and not be driven by subjective (or rather projected from the insurance company) fear! 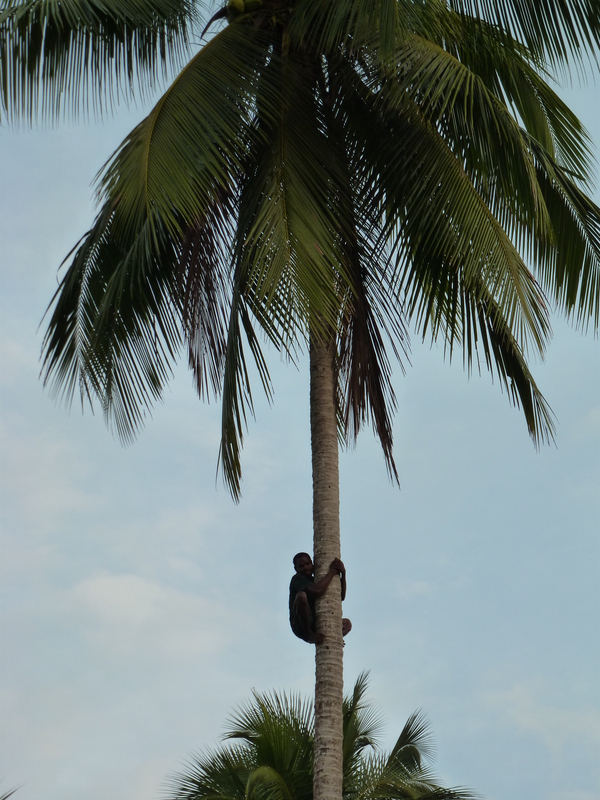 I admit that I did wish I was back in the village experiencing the simple life. Very few possessions, living within our means, subsistence farming. When the river rises during a flood and washes everything away, you just gather your family together and start again…or, mmm, a child may have been washed down the river to their death, or I could leave my husband a widower by dying from bloodloss during childbirth, or he could die from snakebite. Perhaps the village life is not that great. On the outside it appears idyllic, but once you start hearing about the suffering of the people due to a lack of health and education (and this is not overstated marketing, but rather the truth), then the mad, fastpaced world here doesn’t seem that bad after all! On Friday I drove to Pingelly and back (about 2hrs either way from Perth). I went to give a talk to the Mothers of Preschoolers (MOPS) group there. My friend Gael came along for the ride and we chatted nonstop for the 4hr round trip! I really had a good debrief about my trip. It was good to be able to share openly about my experiences and feelings. The night before I had had another call from Vivien. This time the call didn’t drop out and we maintained the conversation until she ended it. It’s difficult talking over the phone without the facial expressions and use of other nonverbal cues that help when speaking with someone who has English as a second language. Once she realised it was me on the phone, there was a real wistfulness in her voice that made me tear up. I felt like I had abandoned all the women along the Keram River! I knew I needed to encourage her, so I said that I missed all the woman, but was praying for them. I asked her if she was doing any teaching and she said that next week she’s going to run a session for the women in her village. I was so impressed. I told her to pray and ask God to help her to remember all that I had taught her and that He would be her helper. She was happy to hear that reassurance. Again I promised that I wouldn’t forget to post the midwifery book to her via Yabru. And I mentioned that Pastor Mike was planning a return trip for July 2013. She was very pleased to hear that. I hope it gives her something to look forward to. Last night my mobile rang four times in a row. The screen said “Private Number” which is what it usually says when Vivien rings. I couldn’t face talking to her last night. I felt I couldn’t go back to Yamen last night. This morning I woke up thinking, “What if she was trying to ring me about a woman in labour who was having difficulties!” Talk about guilt trip! I think I’m going through a bit of grief at the moment. 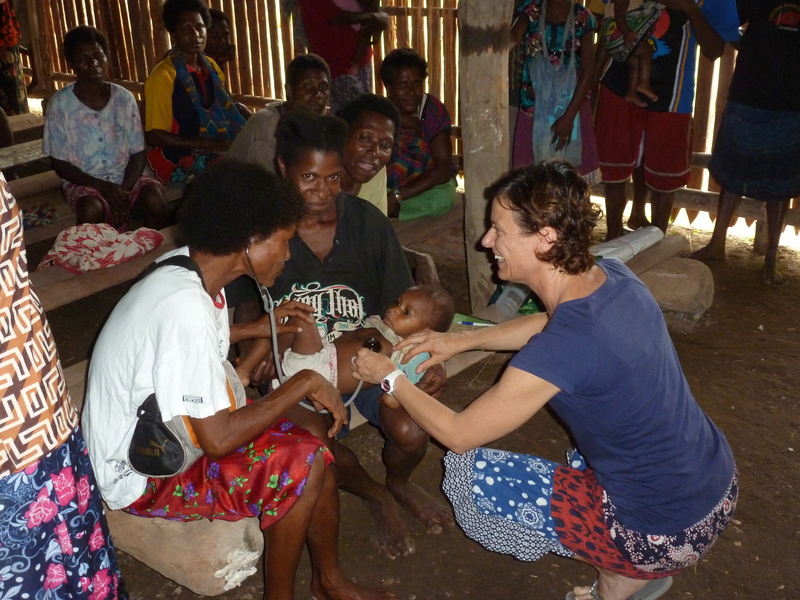 When I first returned from PNG I was in a dream, a world of disbelief that I’d actually been there. I think I’m now going through grief, feeling sorrow and pain for the women, feeling the weight of responsibility to do something for them, feeling torn between my responsibilities to my family and then to the women back in Yamen and surrounds. For now I’ll just let those feelings wash over me. These emotions need to come out. On a really positive note I received a reply to an email I had sent a while ago to a midwifery academic who is working for the World Health Organisation in PNG. I really was delighted to hear from her. She has sent through some great documents to assist with preparing teaching material for the Village Birth Attendants and she really encouraged me in whatever I did for these women. I felt reassured too because the areas that she highlighted to be the focus were what we covered in our sessions in Yamen! We were on the right track. Wow. Well, if we were on the right track, then that’s a great start and I just have to keep moving forward, however slowly, as long as it’s forward! I remember what Mike said when the men of the villages came to our haus and asked me, “So Sara, what are your plans for the women? What is your vision?” To say I felt under a bit of pressure is an understatement! Later Mike said to me, “You can only do what you can do”. Wise words. I was walking the dog in the park while the kids had basketball training, and you’d never guess who called me on my mobile phone? Vivien! The lady in the photo I posted earlier today! “Sara, is that you?” she said. I clear my throat and feel put on the spot, “Vivien it’s so good to hear from you. 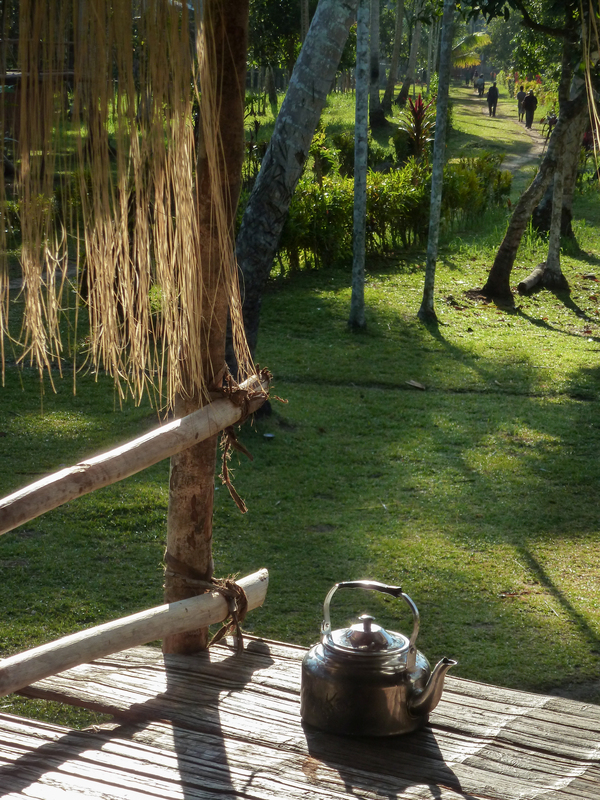 I’ve been terribly sick since getting back from PNG and…” the line goes dead. 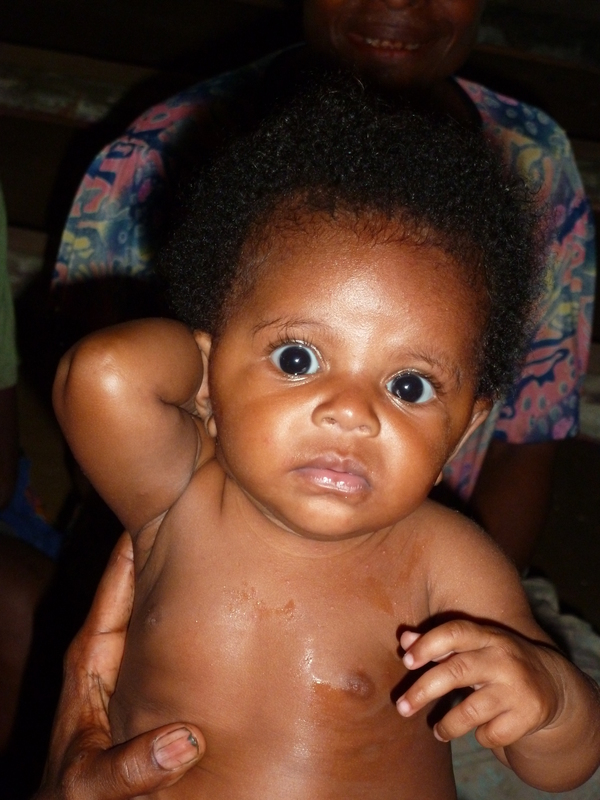 I can’t believe I’ve just had a call from Vivien, Village Birth Attendant from the village of Kumbarumba. She was so keen to learn more and was such a great help. I saw huge potential in her and so left all my teaching resources with her and promised to post the Hesparian book “A Book for Midwives” to her. I’m so proud of her for following up with me!! I’ll post that book this week. It’ll take a while to get to her because there is no postal system to her village! It’ll have to go via a few people. I’ll just pray that it will get to her. Vivien’s village has over 1000 people and she said they have over 300 births a year. 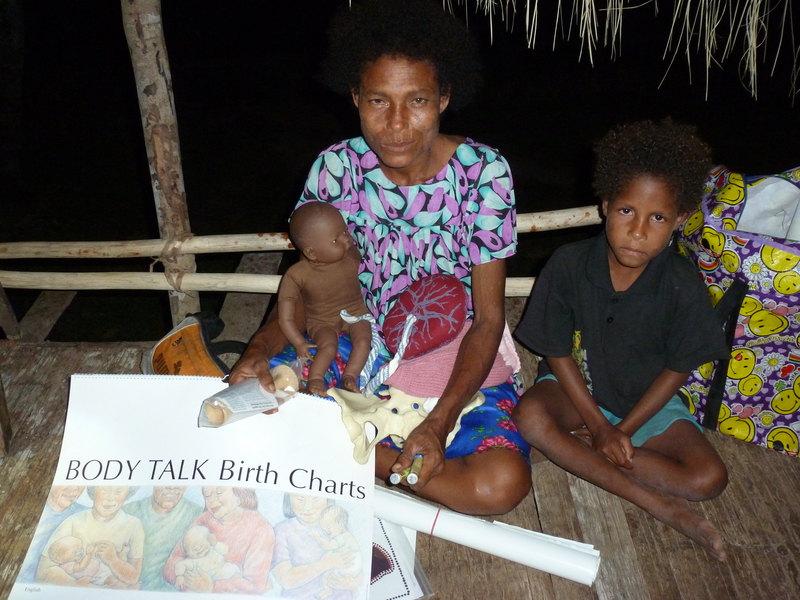 Many women have died in childbirth and she is desperate to help and make a difference. She can read English so I’m hoping that the book will be a great help to her. She is also a strong leader and not afraid of travelling to other villages to teach, so I suggested to her that she needs to share her knowledge. Vivien is named after her Father’s sister. Her Father was an Australian who lived in Angoram before the war and married a local PNG woman, Monika, from a nearby village. She went to school and when she was 11yrs old her father died suddenly in Goroka. She asked me to try and find his family here in Australia. Where do I begin? His name was Norman Liddle, sister Vivien Liddle. Norman died in 1986. He had a cousin named Jim McKinnon. The 4 L’s – Listen, learn, Look and Love. Vivien is definitely one of the women I grew to love. I should not have had the chocolate milk yesterday. Too optimistic was I. Paid for it last night with terrible gripe. My gut is obviously traumatised from that awful bug and will take a bit longer to recover. Be patient Sara. Well, one of the big things we noticed was that everyone walked really slowly whereas we were racing everywhere. It took great self-control and effort to just slow down and amble along with everyone else. Life was simple in the village. Time stood still. It was quite funny because there was a man who beat a drum to let people know what time it was. His name was Raphael and he is the pastor at the village of Kambuku (along the Black Keram on the way back to Angoram). He is this beautiful round man with a huge smile. Anyway, a few times he fell asleep and so wasn’t around to beat the drum for everyone to know what was happening. I’d look across to the haus behind us and see him curled up on the matting floor fast asleep. A few times the church leaders would give the people a stern talking to about being at places on time – for food, church worship, leadership training and the maternal and child health sessions. They were trying to run a conference and make sure everyone got the best out of the event, but it really was an uphill battle getting people there on time. I used to wait about 10 minutes and then make a start. It was quite nice because the only pressure was what I put on myself. They were relaxed, so I could be too, but making sure the information I gave them was thorough and meeting their needs. On the Monday afternoon, after hearing all the stories from the women, I decided to dedicate the entire time to the uterus (haus belong bel). I really wanted them to understand what the uterus is, what it is made of, how it works and also how sensitive it is. I was so thankful for all my work in looking at the uterus in regards to Vaginal Birth After Caesareans and the risk of uterine rupture. Through that research I really feel I gained understanding about the mechanics of how the uterus works and the incredible power it has. I used my knitted uterus, doll and pelvis for demonstration purposes and a 2D drawing of a uterus on the blackboard. I really wanted them to come to the conclusion that it was not a good idea for women to lie flat on their backs during labour and that it was also not necessary for women to push on the abdomen to help the baby out throughout the labour! It was an amazing session because I really felt their full attention and that they really ’got it’. Seeing what the uterus looks like, that it is a strong muscle that works all by itself without our help was a new concept for them. They also really got the idea that through movement, position changes, being upright, slow dancing or swinging the hips, the baby can be wriggled into a better position for birth which can make it a shorter labour and easier birth, rather than pushing on the uterus. They loved it when I jiggled my hips around with the pelvis model in front of my body and then showed how the baby doll jiggled too, finding a better position which will fit through the pelvis. I talked about how important it is to be gentle with the uterus because if it is overstimulated then there is the risk of uterine rupture or that the uterus just doesn’t want to ‘harden up’ after birth because it is exhausted, both leading to excessive bleeding and the death of the mother. There were knowing nods around the room. I talked about safe delivery of the placenta (belum) too, using the doll with attached cord (rop) and placenta. Between Lyn and I we role modelled different birth positions and then showed them how a woman could then recline in a comfortable position for delivery of the placenta. There we were, dripping in sweat, kneeling on the dirt floor of the church, acting out giving birth – I kept thinking, thank goodness I won’t bump into these people on the street in Australia. There was a sense of freedom to knowing that. All our inhibitions were lost and we could just demonstrate it as it is!! Liberating. In regards to the placenta I really wanted them to understand that it is not right to pull hard on the cord, and also for them to learn the signs of separation (when the placenta falls away from the uterus there are 2 signs: a trickle of blood and lengthening of the cord because the placenta has dropped closer to the cervix/opening of the womb. The woman may also have another urge to push). The other issue is, when do they need to transfer to a health centre because of a retained placenta? In Australia, immediately after a baby is born, the mother is given an injection of a drug to speed up the separation of the placenta from the uterus and hence the delivery of the placenta. It usually happens within 10 minutes of birth. In a physiological 3rd stage (where no drugs are given) the placenta can sometimes take up to an hr to deliver. ‘What do I tell these women?’, I was thinking. I then told them what should happen and if by 1 hr nothing had happened or the woman was bleeding heavily, they needed to call for help ie. Get someone to let the men know to prepare a boat for transferring the woman to a health centre. I also demonstrated to them what to do if a woman was bleeding heavily, how to assess the uterus through the abdomen and how to ‘rub the uterus up’ to help it harden up. I hope they understood it all. From the general feeling and energy in the room, I think they did. I now hope it is translated into action and helps to make a difference between life and death. 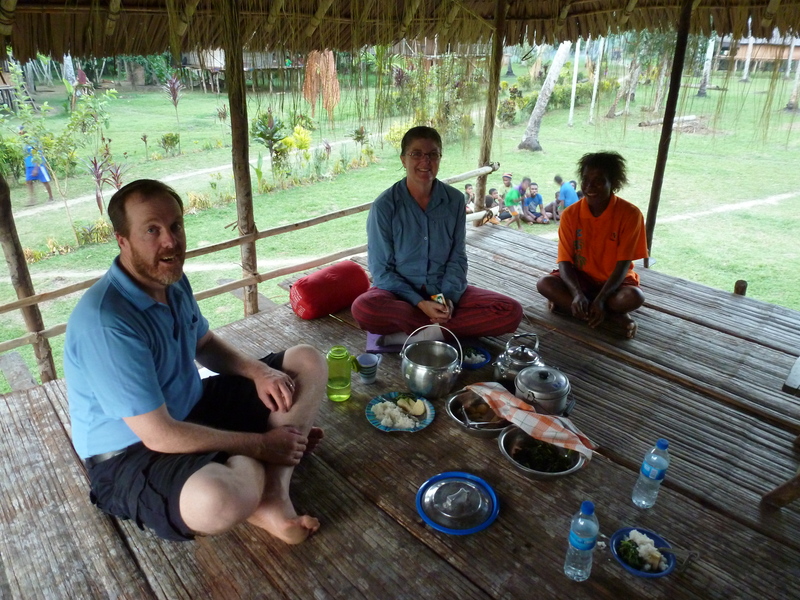 Gina delivering our dinner to us: rice, yam and kumaro boiled in coconut cream, spinach cooked in coconut cream. Yum. I’m having a back to normality day today. Usually on a Monday morning I meet with friends to take the dog for a walk either along the beach or around the river. Today we did the beach. It was wonderful to feel healthy and strong again – I even indulged in a chocolate milk drink which was yummy (I’ve had to stay away from dairy while my gut recovers). So, my energy levels are back to normal and so is my diet, although I don’t think I’ll be able to face a meat pie for a while, just the thought makes me feel ill again!! Writing it down it just doesn’t seem funny, but at the time it was hilarious. We all had tears streaming down our faces. When I think about it, it was probably a reaction to where we’d come from and where we were – places at the extreme opposite ends of the spectrum. We were not rude about our current experience, but it was good to have a laugh about how different it was to life in Perth! Over the last few days when I’ve popped into the shops to pick up some groceries I keep feeling a tad guilty and remember how isolated Yamen was. If you wanted fruit you asked and someone went to their tree and picked some bananas or a paw paw. You then had to wait about 24hrs for it to ripen and then eat as fast as possible because the humidity just destroyed everything quickly (not to mention the midges). Meat is not a staple part of their diet and is only for special occasions. In preparation for the farewell feast they had planned for us for the Friday night, Gina (a beautiful woman who did all the cooking for us) asked if we could eat chicken. Sure we said as long as it has been well cooked. On Friday morning I then noticed a pile of chicken feathers near the haus behind us – ‘that must be our dinner’, I thought! And it was. Gina also asked us if we would have some pig (pork). On Wed and Thursday some men went pig hunting in the jungle. 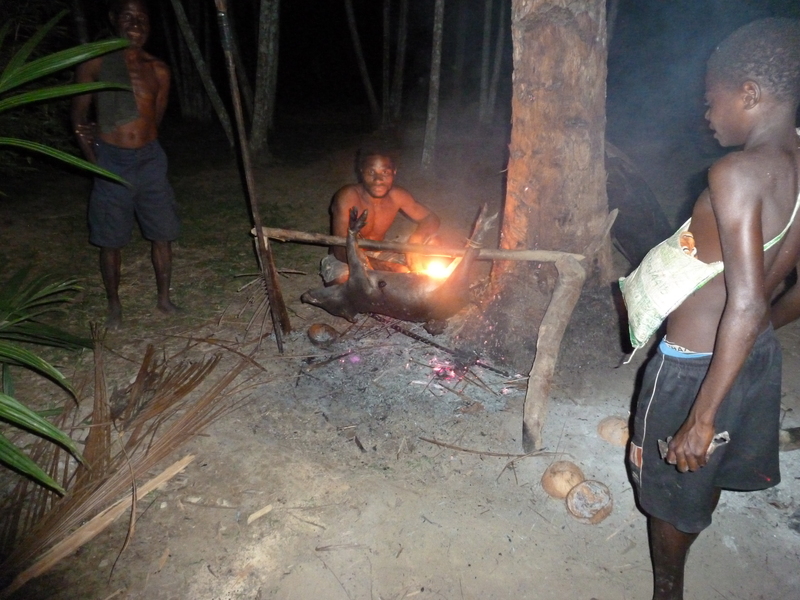 Because it was the dry season they lit fires in a circular manner to trap the pigs in the centre. They then attacked them with spears. 12 pigs were caught for the feast. We watched on Thursday night as they burned off the hairs, then expertly butchered the pig and boiled it overnight in a big pot! And we just stroll down to the local shop to get a few pork chops! How convenient! No wonder we’re all overweight; much too easy getting food in our culture. I think I’ll do the village thing now and have a little afternoon rest. Aaron burning off the pig’s hair. Monday 27th August. The day had finally arrived. The time had come which we had been planning for 9 months. Amazing! We were going to meet the women and start our sessions. The night before Lyn and I had spoken with Mike about how to begin. Early on in my preparations to come to PNG I had realised not to plan too much. Be flexible and see what they want from me. I had also come up with the 4 L’s – Listen, Learn, Look and Love see blog http://wp.me/p2xIUF-1b. Mike encouraged us to share our own stories about birth, bring in the personal to forge links and relationship with the women. Me, we. By sharing our story we were opening ourselves up to them, being vulnerable before them. Very soon I realised that these women were no different to me. Their hopes, dreams, desires were the same. Except that they were suffering from the terrible loss of so many mothers and babies. We were expecting about 30-40 women to attend. As we walked into the church there was no one. Then a couple of women came along. I was beginning to feel that perhaps I’d read the whole situation wrong and there’d just be a handful of women. I handed the brown baby doll with placenta around to them to look at and handle – they loved that. Then the floodgates opened! All of a sudden there were women everywhere! Babies too. Older children were chased out by the women!! They peered over the low screen that surrounded the church. It was incredible. Now the room was full of expectant faces – all looking at us. I remember looking across at Lyn and we just gave each other a knowing look: Wow! Ok, let’s do it. Heidi had been assigned to interpret for us. She was a very shy young woman who was not very confident, but she did a great job. I knew I had to speak slowly and clearly using simple terms. Waiting for her to interpret for me allowed time to think more clearly about what to say next. I welcomed everyone and told them how pleased we were to be there. I then explained to them what we planned to do for the morning session. I then introduced myself – that I was a midwife, that I was married to Richard, that I had 2 sons aged 11 and 9. I then went on to describe my birth experiences. I used the doll and the pelvis to explain how Ryan had got stuck after a very long labour and so I needed a caesarean section. They understood the whole concept of long labour, baby getting stuck, but their experience of that kind of labour is usually the mother and baby dying. I went on relaying my Vaginal Birth after Caesarean VBAC of Matthew – again another long and difficult labour. They got it. We were on the same plane. Lyn then introduced herself and while telling the stories of her births, I used the doll and pelvis again to illustrate what had happened for her. The women were mesmerised and seemed to hang off every word and watch intently. Then it was time to hear from them. 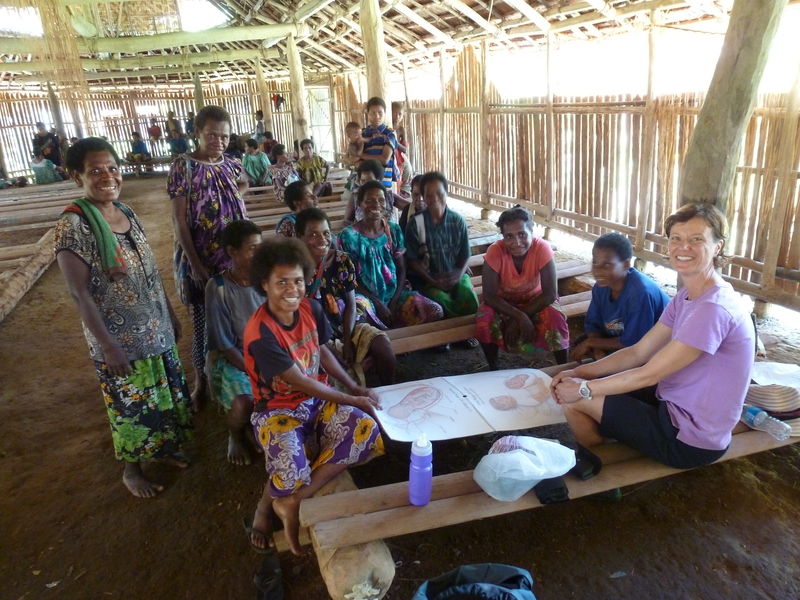 I tell them that we have heard that many women die in Papua New Guinea when giving birth – big visible nods around the room. The women are actually very shy and do not speak of their own experience, but when we ask them why they think women and babies are dying, they begin to share their experiences. Immediately the floodgates are opened. From all over the room stories were told. In my diary I’ve jotted down the reasons for women dying: Mostly from bleeding, placenta stuck, mum exhausted and unable to push baby out (both die), baby dies inside the womb and then the mum dies as well, Malaria and other infections. The reasons for babies dying: umbilical cord not tied off properly, infection and baby too small and weak. The women tell us that a woman in labour lies flat on her back throughout labour and does not move. Then another person pushes on the pregnant belly to help push the baby out. I want to cry… I can see it now: a woman in agony, unable to move from her back, others pushing on her belly and probably traumatising the uterus causing it to rupture or else not clamp up after the placenta (belum) is delivered, hence the woman exsanguinates to death. They also tell me that women pull on the umbilical cord to get the placenta out and many times the uterus (haus belong bel) comes out as well. Oh dear! Before I left Australia I remember reading a book called “A Book for Midwives” published by the Hesparian Society. 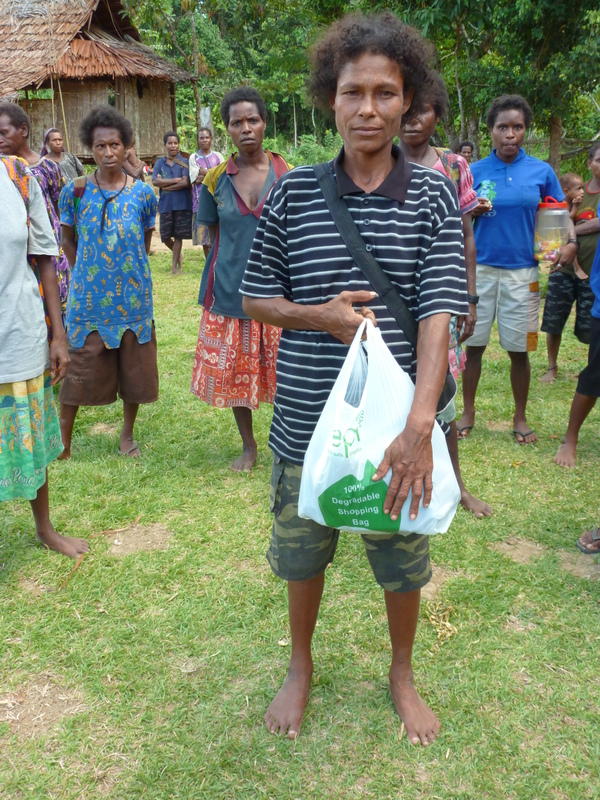 They publish books and resources to assist health carers in the third world. All the material has been donated free of charge by experts in their field. The textbook for midwives was excellent and so practical. A comment that stood out for me at the time and which flashed through my mind was that many village birth attendants have not had any formal training, have taken on this role because they have watched many births and heard stories, but what can happen is that wrong practises get passed on through the generations just because that’s how things have always been done, rather than there being any education about the practise. So, even though what I heard made me want to cry because some of the practises were probably contributing to the deaths of the mothers and babies, I had to show great respect and restraint and very gently educate them about how the body works to labour and give birth. I certainly didn’t want to be pointing fingers, rather encouraging them to be the advocates of change through better knowledge. After listening to the stories of women dying – we were told over and over again it was ‘many’- it was obvious that they were traumatised, feeling hopeless and desperate about all these deaths, I had some divine inspiration. I thanked them for sharing their pain with us. 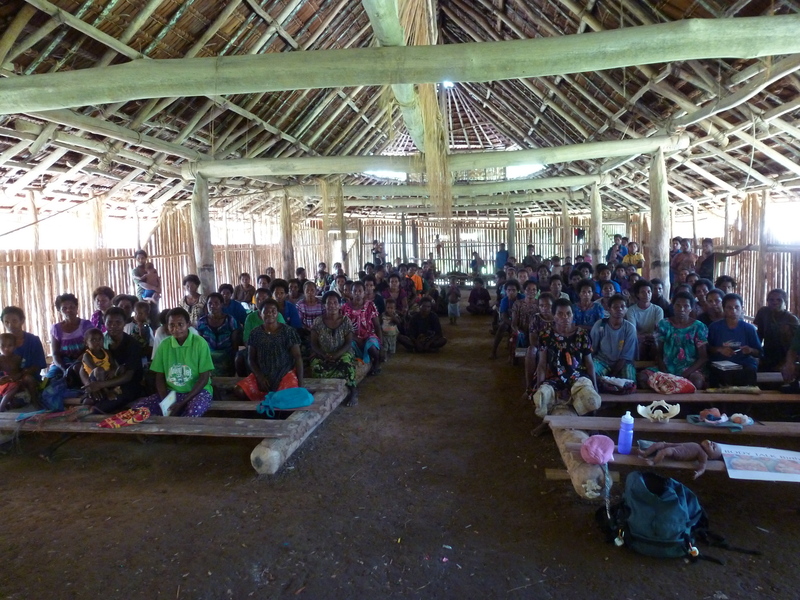 I then encouraged them that each woman sitting there that morning was either a chicken or a pig (read previous blog http://wp.me/p2xIUF-3j) because they were there wanting to learn and make a difference for the women in their villages (by this early stage I only thought there were about 5 villages represented, later on I learned there were 19!). I congratulated them on their willingness to serve the women in their communities and told them that they could make a difference and help save lives, by sharing what they learn through the week and then telling others. I reminded them that if everyone does a little bit, small steps, big changes can happen. They were nodding their heads vigorously. I then suggested that we pray for all the souls of women and babies that have died in the past and ask God to help us be women of change, to learn many things this week that will make a difference to the lives of women and babies in their villages. Now remember, when they pray it all happens together, so there was this beautiful moment where all the prayers of the women rose up to heaven. It was a truly memorable experience and I just knew that God was there with us and that He heard our prayers. A local family moved out of their house (haus) to make it a home for us. It really was a beautiful haus. Simple, neat, near the church and the river – perfect location. The handiwork was exquisite. Lyn and I shared the one enclosed room, Mike and Yabru shared the kuk haus (kitchen). We had to walk carefully on the matting and make sure we had a wood join beneath us otherwise we’d fall through it! Our haus was our sanctuary really. We could retreat there and find peace and quiet, lie around and rest, share ideas and plan sessions as well as meet visitors. Some days there were a constant stream of visitors wanting some personal support, encouragement, assistance with problem solving. I learnt a lot from Mike and the gentle way he dealt with people and their concerns. Always quiet, calm and loving. As I sit here at my desk and I think over my thoughts and feelings at the time prior to the first session for the women I remember feeling quite inadequate. We had been welcomed in the most extraordinary way, now the weight of the people’s expectations were heavy on me. I woke up early on Monday morning after a restless sleep – tossing and turning a number of times to find a comfortable spot and also disturbed by the constant fighting dogs! I went through to the porch and sat and watched the sun come up over the river and light up the village. I opened my daily devotion and there was this verse: Isaiah 48:10 ‘I have chosen you in the furnace of affliction’. Charles Spurgeon, a great theological scholar, wrote that when we are stripped of all physical comfort and strength, in the fiery furnace, that is when God can use us most effectively. Gee I could relate to this. Even at 7am in the morning it was stiflingly hot and humid and I really did feel stripped of all known comforts. I felt reassured not to worry about what I would say or do, but just rely on the leading of the Holy Spirit and He would be with me and help me. I knew I was chosen to be in Yamen, now I needed to trust God that He wouldn’t just bring me there and then abandon me! Each morning at 8am there would be a short devotion service in the church. We grew to really love those times. Men on one side, women on the other. They start by singing and then have a time of prayer. When they pray, there is no silent prayer. Everyone prays out loud at the same time. It’s actually quite beautiful because you have a sense that all the prayers are gathered collectively and then offered up to heaven as a fragrant offering, wafting upwards.